Banner & Witcoff has represented design patentees for decades in both prosecution of design patent applications in the U.S. and around the world, and in the enforcement of U.S. design patents. Our clients are multinational, innovative design driven companies. We work with our clients to achieve their business goals in both the procurement of strong patent portfolios and the enforcement of patents. The firm has several attorneys who are experienced in rendering opinions as to infringement or noninfringement, resolving conflicts with infringers, litigating design patents in U.S. District Courts and appeals to the Court of Appeals of the Federal Circuit. The firm also has a specialized design team led by Robert S. Katz which handles prosecution of design patent applications. Banner & Witcoff recognizes the importance of design patent prosecution strategies and the enforcement of design patents, which we believe is important to procuring strategic and strong, enforceable design patents. Our attorneys are supported by a team of design assistants who handle the administrative tasks of design patent prosecution in a systematic and efficient manner. The design team works closely with the U.S. Patent and Trademark Office during all phases of prosecution. The majority of the firm’s design prosecution is for U.S. companies, and accordingly, the design team is experienced in preparing original U.S. applications and handling counterpart applications world-wide based on the U.S. application. The team also handles numerous U.S. applications with a priority application filed first elsewhere, such as Japan. 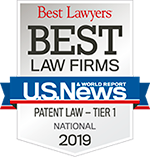 In 2017, for the 15th consecutive year, Banner & Witcoff obtained more U.S. design patents than any other law firm in the country. Banner & Witcoff also broke its own record for the most design patent grants in a single year. According to U.S. Patent and Trademark Office records, the firm procured 1,424 U.S. design patents in 2017. The firm set the prior record with 1,032 U.S. design patents in 2016. Recently, Banner & Witcoff worked to protect many popular and prominent designs for longtime clients Nike and Microsoft, including the Nike Lebron XII Low basketball shoe and Microsoft HoloLens head-mounted computer. The firm continued to expand its design patent practice and has now procured portfolios of 20 or more U.S. design patents for more than 40 different companies, as well as portfolios of 10 or more U.S. design patents for 50 different companies. Banner & Witcoff also continues to lead in procuring international design patent portfolios. The firm has filed hundreds of design registrations in the World Intellectual Property Office for clients who reside in member countries of the Hague System for the International Registration of Industrial Designs. The firm began seeking the same international protections for U.S. clients once the USPTO put procedures in place for accepting Hague System applications in May 2015.